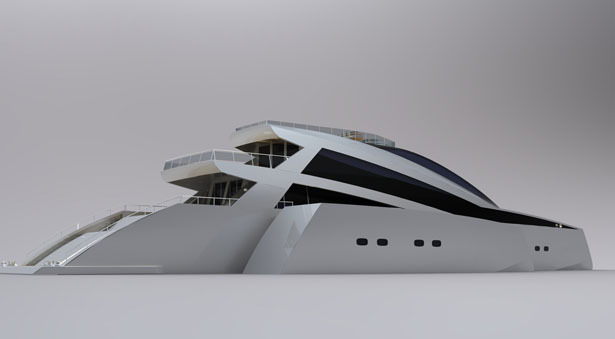 Sirena trimaran yacht is a 50m trimaran, designed by Adrian Smith and Matthew Jeffrey. 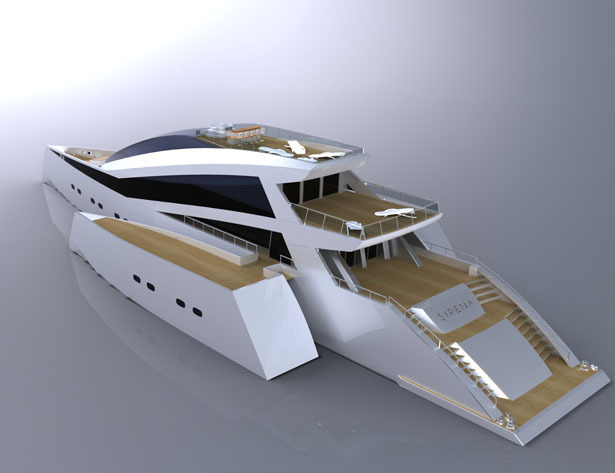 With an ever increasing need for more environmentally friendly motor yachts, a trimaran provides a more efficient platform for a super yacht, with a lower drag coefficient, resulting in lower emissions and a larger interior space. 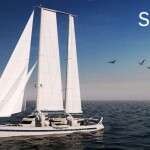 Sirena Trimaran Yacht is primarily powered by a Vericor gas turbine engine in the center hull which would provide most of the propulsion for cruising, two caterpillar diesel engines on each of the outriggers can also be engaged which can push the vessel to an impressive 30 knots when needed. 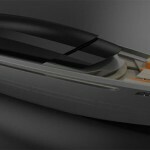 The platform uses highly efficient Azipod Drive technology to add to its environmental credentials. 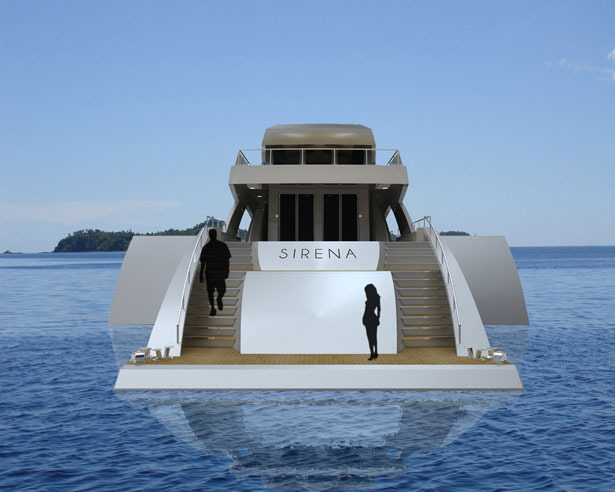 Sirena’s interior has been designed with quality, durability and style in mind. 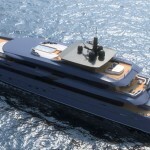 It has rooms for up to 12 crew and 12 passengers on board, people movements were considered carefully, meaning the owners and guests can enjoy the privacy they demand but allow the crew to provide the high quality service they work so hard to achieve. 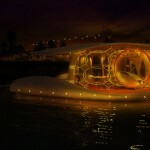 The guest suites are located in the outriggers with an open deck above them dotted with roof lights, allowing as much natural light ingress as possible. 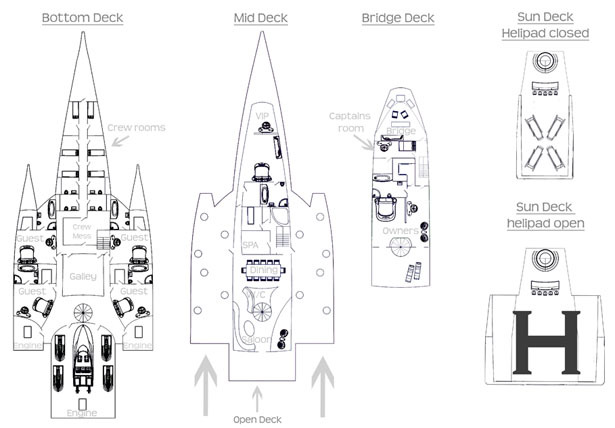 The owners suite is on the bridge deck, and boasts its own private balcony, walk in wardrobe and panoramic views. 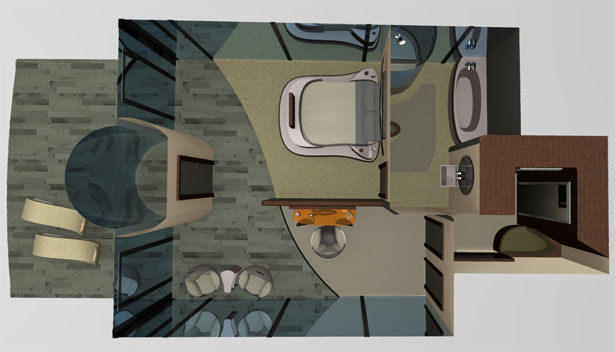 All of the non crew rooms include on suite facilities. 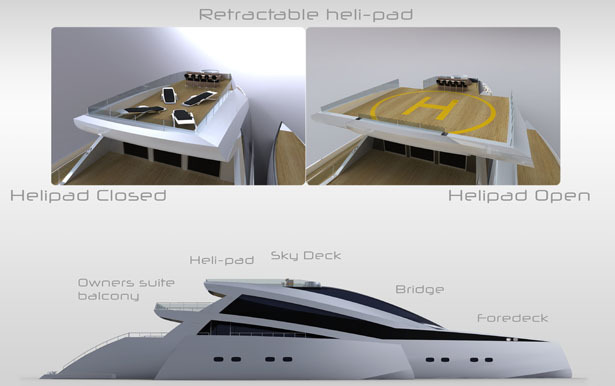 One of Sirena trimaran yacht’s defining features is her retractable helipad, which is operated by hydraulic arms on her top deck. 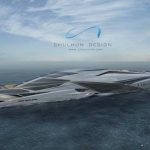 This feature means no exterior space is fully committed for a helipad, but the ability to land onboard is still available. 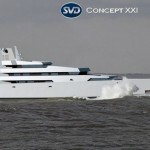 In Summary this exciting new super yacht is a unique alternative to the traditional mono hull. 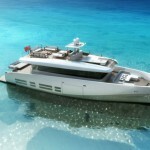 Sirena Trimaran Yacht modern styling and the technologies she embraces reflect the possible directions of the market and provide a fresh perspective on Super yacht Design. 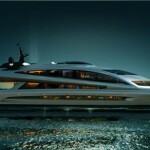 This entry was posted in Designs and Concepts, Green, Yacht and Boat. 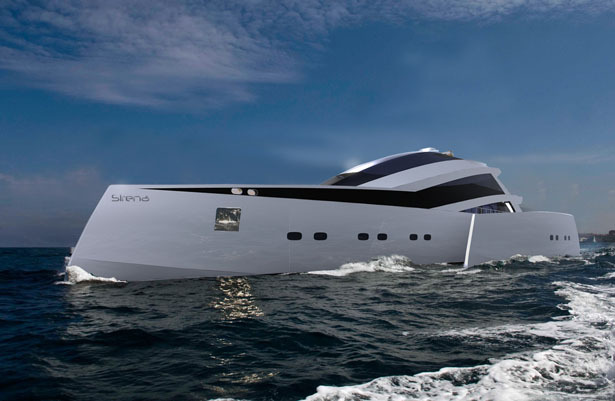 Tagged as caterpillar diesel engines, crew, gas turbine engine, helipad, high quality service, hull, interior, motor yachts, platform, walk in wardrobe. 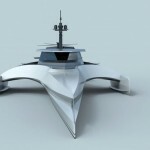 Nice, make it submersible & im In, love the Helipad but Id place it aft over looking stern with tie downs for copter & provide shade for aft end of yacht, Nice concept, Id sail one around Hawaii.